If you’re looking for a special treat or gift for that special chef in your life – even if that’s you! – then it will be my pleasure to help you. These boards are handmade by me in my garage woodshop. Though I do have a number in inventory, I also am happy to make one exactly like you want it. With just a few week’s notice, I can custom design and construct a board for you in time for a wedding, anniversary, Christmas gift … whatever. I enjoy helping people, and it will be my pleasure to help you. 1. Where will the board be delivered? If you’re picking up from my shop in Valencia, that’s free. If I’m shipping to you, then I will charge you my direct shipping costs. 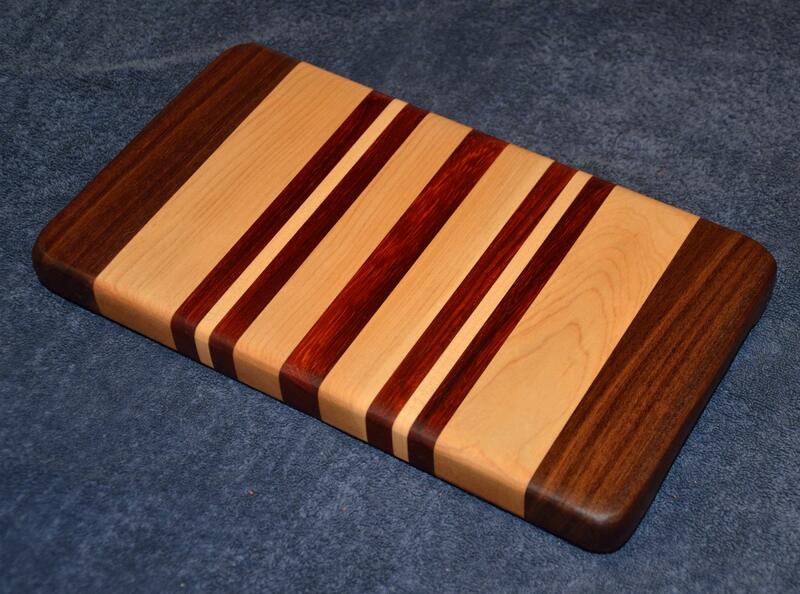 Cheese boards are 8″ x 10″ x 3/4″ up to 12″ x 19″ x 1-1/2″. Small boards (which can be used for anything) are 8″ x 10″ x 3/4″ up to 12″ x 12″ x 1-1/2″. 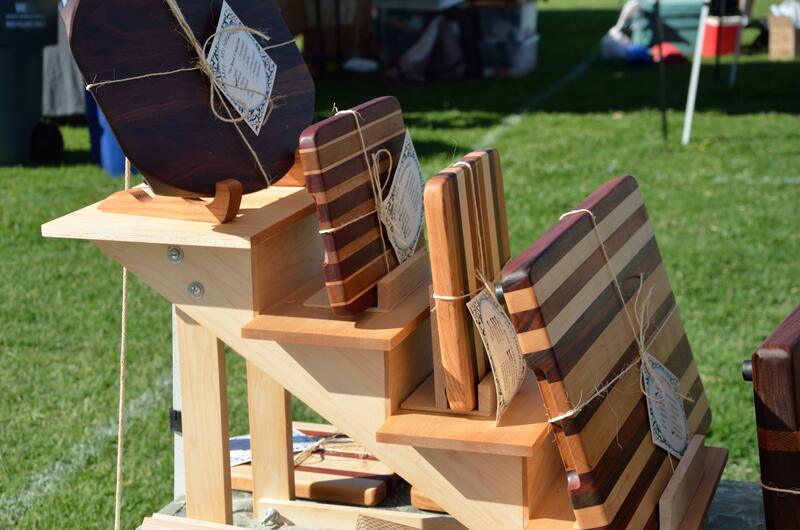 Cutting boards are 12″ x 12″ x 1-1/4″ up to 16″ x 24″ x 1-1/2″ … and beyond. This is an edge grain board. 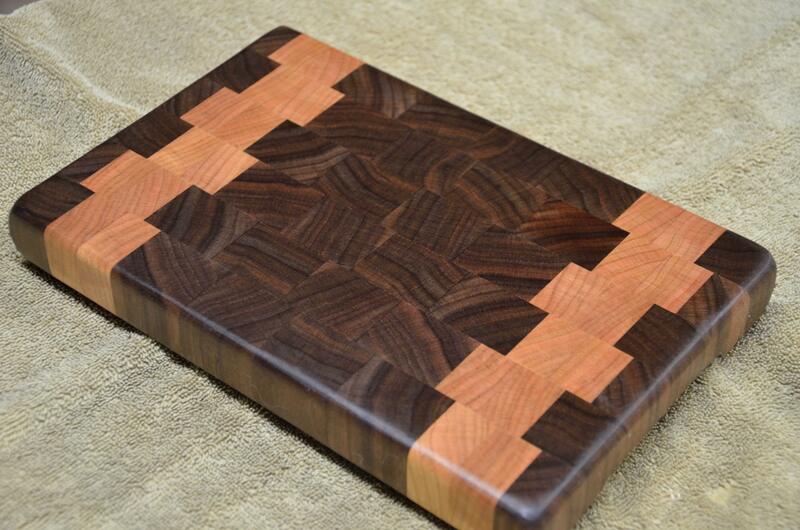 This is an end grain board. 4. Edge grain or end grain? To some, this is an aesthetic question. If you like the striped look, then you want edge grain (meaning the sides of the boards are the top of the cutting board). If you like more of a checkerboard look, then you want end grain (meaning the ends of the board are the top of the cutting board). End grain cutting boards are the classic butcher block, and they will show somewhat less wear than typical edge grain boards. However, I use only hardwoods (and I mean VERY hard woods), so your board will not show wear the way that many boards of lower quality show their wear. 5. Juice groove? If you want a juice groove on one side of your cutting board, I’m happy to cut one for you. The cook in my life does not prefer a juice groove … she will say that if you let meat properly finish cooking on your counter before you begin to cut it, then you really don’t need a juice groove. That’s her opinion; your mileage may vary. 6. Personalization? Engraving is now offered on both cutting boards and small boards. You’re only limited by your imagination, really, but I have a few designs for your consideration. See them on the “Engraving” post (which will be up by the end of January). Almost all of these boards come with routed finger holds and non-skid rubber feet held on with stainless steel screws for long life. Some of the engraved boards are intended to be used (or simply displayed) on both sides, so those do not come with feet. If you want something different from my typical offering, you need but ask! Hi, Jim, the best place to see the shows we have scheduled is on my other website, MowryJournal.com. See that schedule, here. Are you still making lazy susans? Absolutely! I have a half dozen on hand, I believe. All are about 18″ in diameter; other sizes available upon request. I’d like more information on your trivets and I can’t find it on your site. Thanks. I will do a page devoted to Trivets next week. I can’t believe I’ve missed featuring them on this site! Meanwhile, you can always see *everything* that I make on my blog, http://www.MowryJournal.com. Hi…how much would it cost to order a 16×24 edge grain board like the one pictured on your ordering page with juice grooves and personalized with The Wallert Family on it? Also delivered to clovis, CA and would it be here before Christmas? Hi, Jamie, I’ll send you a PM. Yes, I can still make Xmas delivery!